Cornell's art is delightful, fascinating, and obscure in equal measure - with an additional shot of infuriation. You have to enter in the world of someone (b.1903-d.1972) who hardly ever left New York, never left the US, yet who travelled in his imagination compulsively to Europe, back and forth in time, ahead of the artistic curve, drawing inspiration from past, present and perhaps future - the Exhibition is subtitled "Wanderlust". 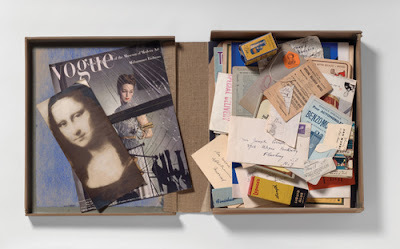 He did it in collages, dossiers, and boxes. It's one of those exhibitions where (IMHO) the audio-guide, spoken in terms as poetic as the works themselves, is enormously helpful if you want to get what's going on; and the catalogue is excellent, too (page references below in square brackets). Cornell was self-taught, and was immersed in the art movements of the twentieth century while pledging allegiance to none; he even resisted the term "artist" [p.16]. His raw material was bric-a-brac and ephemera garnered from flea markets, junk shops and second-hand book stores. He fashioned an archive, or collection, a reservoir of resources, containing a myriad of curios - quotidian, and esoteric - and documents, including personal diaries and jottings [p.18]. But his harvesting was not random; it was sorted and classified into subjects, themes, intermingled associations, and motifs, coming from and feeding back into his reading, and his profound interest in history, opera, poetry and European culture. Apparently after one prodigiously informed conversation about Paris with Frenchman Duchamp the latter simply couldn't believe that Cornell had never been there [p. 52]. He knew, and was envied by, the artistic avant-garde - with a surrealist inflection - in the USA between the wars (leavened as it was by emigration from Europe, especially with the rise of Fascism); after the war he engaged with Abstract Expressionism [p. 25]. Cutting-edge gallerist Julien Levi exhibited him in 1932 [p. 246], Duchamp befriended him in 1933 [p.123], Dali accused him of theft from his subconscious in 1938 [p. 110]. He cared devotedly for his brother who had cerebral palsy, bemused and bewitched a succession of ladies, and never married. He was interested in birds (among all those other things), and in the 1930s had a revelatory experience in a pet shop (I'm not making this up, it says so on page 161). In the Habitat Group above he is evoking the fairground shooting-galleries of his childhood, and the talking parrots of the fortune tellers. But the glass is shattered and blood is shed, spattering and soiling the symbols of European art and learning pasted behind. Civilised values are despoiled. Cornell is reflecting on the cataclysm of World War Two [p.161 again]. This is one of the easier works. So, of Cornell, as with so many before and after him, we ask the perennial question: could he play chess? And, if so, with whom? Well, Duchamp, his friend, could, of course. And you can see why they would be confrères, since they both turned every-day bits and pieces into art-works. In fact Cornell even made a Duchamp Dossier (1942-53) containing what you could call 'duchampephemera', paperwork mainly, in a lidded cardboard box: Cornell documenting Duchamp. 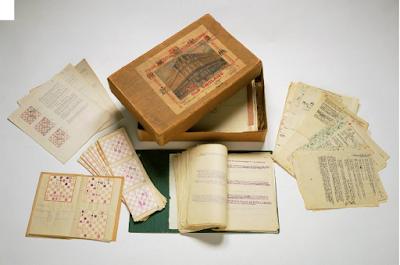 You can see their creative exchange at work in Duchamp's Box of 1932, a collection of his own chess trivia, which we discussed in a post here when it turned up at an exhibition at London's Barbican in 2013: Duchamp documenting Duchamp. There must be a good chance he and Cornell played chess, one might think. Another artist who Cornell befriended and admired, in a chaste and chivalrous manner, was Dorothea Tanning, (someone we have ourselves flirted with, on the blog here, at her 100th birthday in 2010; sadly she died in 2012). Dorothea famously pushed pawns with Max Ernst in a higher form of foreplay, and Max made a chess-art-work to consecrate their relationship (they married). 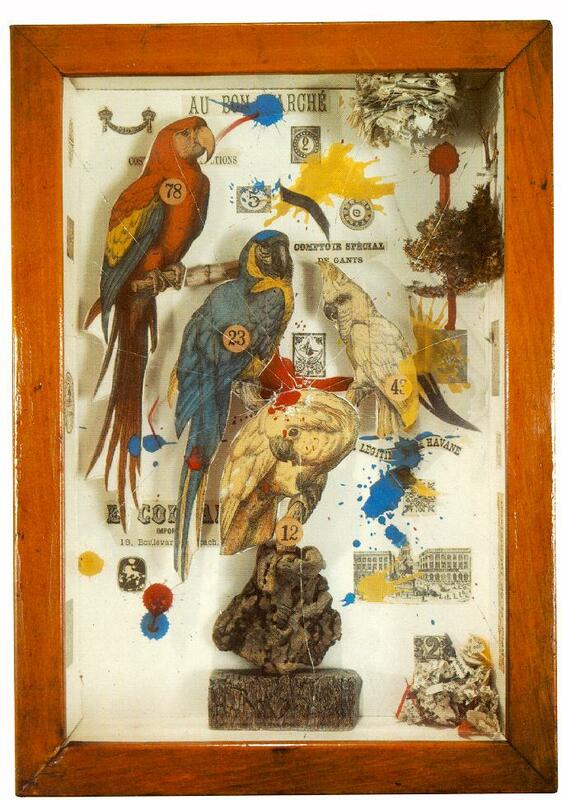 One of Cornell's embellished letters to her, dated 1947, is in the exhibition [p.172-3], complete with signature birds. The catalogue says they "formed a trusted friendship based on their kindred feeling for romanticism", and maybe Joseph and Dorothea played courtly chess together. ....suggesting an unusual interest in the game, and perhaps she might have played with Joseph, in the manner of Max and Dorothea even. But these speculations are beside the point. For all his association with chess players, and his close encounters with their chess pieces - not to mention their loose ubiquity in junk shops and rich potential for boxing-up etc. - there is not so much as a pawn in the RA exhibition, nor, as far as I can see on the Web, anywhere in Cornell's art. 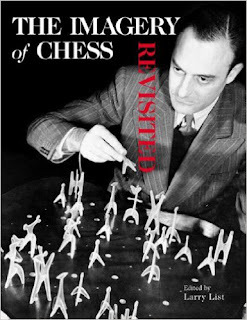 For a possible explanation, I consulted Larry List's The Imagery of Chess Revisited 2005) which discusses and reconstructs chess fanatic Julien Levy's fabulous The Imagery of Chess exhibition of 1944-5. 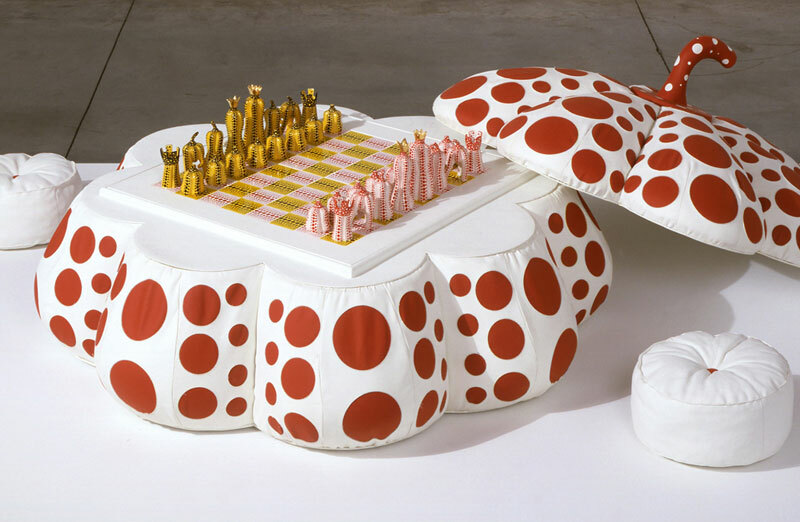 The show, in New York, was "orchestrated" by Duchamp and displayed chess-themed artworks created by such as Breton, Calder, Duchamp himself, Ernst, Man Ray, Tanguy etc etc - in short, anybody who was anybody in mid-20th century contemporary art. Joseph Cornell is indexed several times in the volume, and the following quote from Ingrid Schaffer's Introduction is pertinent. Levy, by the way, coined the apt phrase "toys for adults" for Cornell's work, and - as has already been said - was his champion. Levy says (in an extract from his own memoir) that Cornell was invited to take part in the Imagery exhibition. He declined. Schaffer is the only other person who mentions "Cornell" and "chess" in the same sentence, and gives us the only explanation that I have found of what turns out to be Cornell's chess-aversion (the RA catalogue is unaccountably oblivious to this gaping hole in his intellectual universe). She writes: "perhaps his noticeable absence from the chess show suggests some conscientious objection to war games." "Conscientious objection to war games"? If that was the reason - related to his adherence, maybe, to Christian Science [pp. 28-29] - then Cornell was surely rather missing the point of chess: it was conceived, we are always told (did he know otherwise? ), as a substitute for war. What a pity then, that for all the breadth of his cultural intelligence, this refined, poetic, and enigmatic "artist" didn't, perhaps by virtue of a dogmatic misapprehension, leave a Cornellian chess work - in a box, of course - for us to muse on and puzzle over. 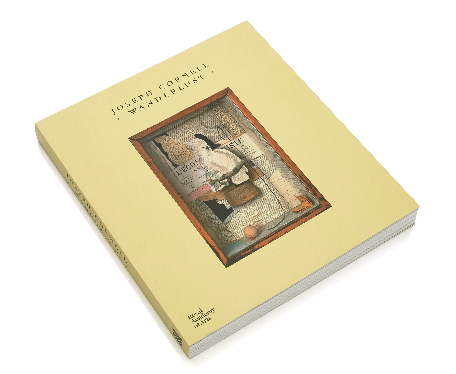 Larry List, The Imagery of Chess Revisited (2005) published by The Noguchi Foundation, New York.